ON THE ISLAND of Sicily, 2,200 years ago, a White man contemplated infinity. His name was Archimedes. 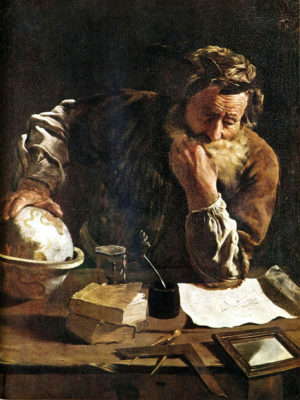 Trying to solve a problem, Archimedes then reasoned about infinity from another perspective: If you create, for each integer in a list — such as one, two, three, and so on — a matching even number, so that one is matched to two; two is matched to four; three is matched to six, four is matched to eight, et cetera, then you have an even more astounding paradox. That series of matching numbers can, obviously, be continued without end — and you will never “run out” of even numbers to match with the integers. So you end up with the following paradoxical conclusion: The set of all integers and the set of all even integers are the same size. Obviously true — yet, how can it be true? Archimedes was trying to solve problems involving 1) calculation of the perimeter of a circle of a known radius, and 2) calculation of the volumes of complex solids with curved dimensions, problems which he was the first man on Earth to solve. The result of his calculation of the circle problem was the first accurate mathematical proof of the value of pi, and his results were true within less than one one-hundredth of one percent error. The results of his contemplations of the solid geometry problem, in the course of which he was able to mathematically derive the total area of an infinite number of slices of the solid — in effect calculating the area under the curve of its shape — form the basic ideas behind what we know today as calculus, without which modern physics, science, and technology would be impossible. Arichmedes was an amazing man, and a great contributor to the advance of consciousness in the Universe. On this program I have just barely scratched the surface of his discoveries and creations. One would think that the results of his lifetime of creative thought would fill many volumes. Such was likely the case during his life — but such is emphatically not the case today. For everything we know of Archimedes’ writings comes from just three slim volumes of treatises — among which there is some repetition — known as Codex 1, Codex 2, and Codex 3. Everything else has been lost. In fact, Codices 1 and 2 are now lost again and have been for hundreds of years — but, thank God, before they were lost they were copied by scholars. As for Codex 3, it was not even discovered until 1906, was lost again until 1998, and was not able to be fully read until 2008. How fragile is the thread leading to infinity. Why was Codex 3 not discovered until more than 2,000 years after Archimedes’ death, and why did it take until 2008 to read it in full? The short answer is this: Because of a primitive Semitic religion called Christianity that infected the mind of European man and made him disregard real knowledge and true consciousness for centuries — centuries in which our people languished in superstition and ignorance, pursuing chimerical Jewish fantasies masquerading as truth. Millions of our people still so languish, a condition which may well be fatal to us. The full story of the fate of this book is full of symbolic parallels — even up just a few weeks ago. In the twelfth century, Codex 3 existed in full, readable form. It was a tenth-century Greek copy, probably only a few versions removed from the original, including even Archimedes’ own drawings and diagrams, originally drawn on ephemeral sand. But, after the rise of Christianity and the destruction of our people’s magnificent temples and libraries — on the grounds that they were pagan and “unscriptural” and therefore offended the Jewish god — and the forced closure of the philosophy schools, interest in the scientific questions and principles of the Universe that had occupied Archimedes’ mind was in steep decline. By the twelfth century, the Greek copy of Archimedes’ works that we now call Codex 3 had made its way to a monastery library in Jerusalem. It was thought of so little value that when a scribe there was ordered to make a new prayer book, instead of obtaining new and expensive parchment, he took this unique, irreplaceable treasure, cut it into pieces, and used a knife to scrape off and almost obliterate the words and drawings of Archimedes. In their place he wrote prayers to Jewish Jesus and Jewish Yahweh. Where once the discoveries of the real Word of God were written — the mathematics that defines and binds together the Universe — he wrote Semitic drivel so primitive that it makes one embarrassed to be human, crowning it all with a final insult when he re-bound it with a cover emblazoned with a giant Christian cross. It was only with the greatest difficulty, utilizing the latest imaging and digital restoration techniques, and a team of dozens of scientists and scholars, that most of the text was finally able to be read and shared with the world in 2008. No one with any amount of knowledge of what is valuable and what is not, of course, was at all interested in the Christian prayers. They were merely what was in the way — the obstacle — to the truths and discoveries to be found beneath them. As I said, this story is rich in symbolic parallels. And that is not even the end of the parallels. The Christian near-destruction of this book was not the only obstacle to its rescue. Codex 3 was lost again some years after its discovery in 1906. It fell into the hands of a crooked dealer in antiquities who forged some medieval illuminated paintings on its pages in an effort to make more profit on its illicit sale, further complicating the process of recovering the words of Archimedes. Ultimately, those pages were only able to be read through the use of synchrotron light at the Stanford Linear Accelerator Center in Menlo Park, California. So — to Semitic religion, add greed as another evil that almost destroyed this work of truth. To greed, add neglect. For decades, after changing hands several times, Codex 3 lay nearly forgotten in the basement of a private home, where mold ate through the pages and almost dissolved the words hidden there. Is this not yet another parallel to the way in which European man has lost his way? False religion — greed — neglect. Each of these came close to destroying the Codex. Each of these is destroying our race as well: False religion, in which the Semites’ tribal god and the nonsensical scribblings of Middle Eastern rabbis replace the search for truth founded on the real Words of God — mathematics, physics, and genetics — clouding our vision and greatly impairing our ability to do what needs to be done to insure our survival and progress. Greed, in which short-term profits and spending one’s life on the hamster-wheel of usurious Capitalism replace our real duties to the future generations of our people. And neglect, in which we “enjoy ourselves” with mindless entertainment or pointless chatter — while the clock is ticking for our looming extinction, and the inevitable closure of the window during which life’s escape from the bounds of Earth may still be possible. Fragile indeed. There is one last ominous parallel to our plight in the fate of Archimedes’ Codex 3. It has to do with the threats to the survival of the Codex that exist right now. It has to do with where the Codex is. Codex 3 is now located at the Walters Art Museum, 600 North Charles Street, Baltimore, Maryland. It was the Walters’ William Noel who led the team that rescued the Codex. 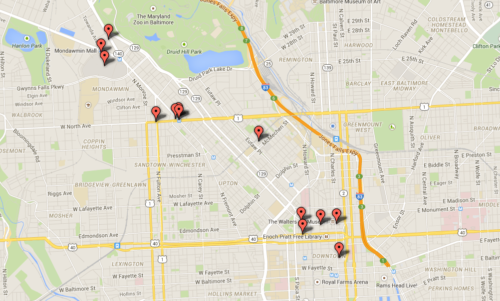 If you examine a map of the Black riots in Baltimore of just a few weeks ago — a map of violent incidents, including the torching of buildings, which I’ll include in the text version of this broadcast — you will clearly see that a large part of the savages’ destruction of the city we essentially gave to them took place within feet, literally within just a few feet, of the Walters Art Museum and the Archimedes Codex within. 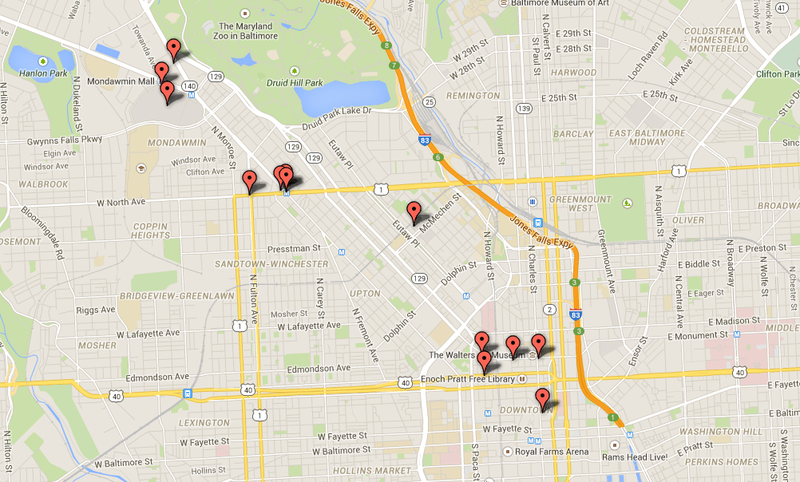 Baltimore Riots incident map, April 27, 2015. The Walters Art Museum is located near the lower right confluence of five recorded incidents. False religion — greed — neglect — and savage mobs. The mobs of 1500 years ago, egged on by Christian fanatics, who burnt the Library of Alexandria and wrecked our temples and great schools of philosophy were largely low-grade members of our own race — and we were a race which, though we declined into the Dark Ages due to our own gullibility and stupidity, still had the vitality to retain our own territory and genetic integrity. And so we recovered from our fall; though, had the alien religion not corrupted us, we likely would have discovered the Americas in 492 instead of 1492 — and walked upon the surface of the Moon in 969 instead of 1969. Today, though, the savage mob that wreaked violence and destruction literally within sight of Archimedes’ Codex 3 is a mob not of our own race. And their numbers are increasing. Due to their importation, fecundity, and their close relationship with the Jewish power structure, these savages have taken over the cores of our great cities and hold the levers of power within them. How long can an institution like the Walters Art Gallery last in a city — in a nation — of violent, ignorant savages? How long, indeed, can something like the Stanford Linear Accelerator Center last in such a nation? How long can NASA last? Or the libraries of precious, irreplaceable knowledge? The servers — not much less ephemeral than the sand impressions in which Archimedes sketched his ideas — which carry all the data that makes up the Internet — how long will they last? The savages already outnumber us in the maternity wards. The generation now being born is our last chance. These really are questions of the most momentous import imaginable. As the writer David Sims pointed out in an article published yesterday on National Vanguard, with the possibility of the short-term destruction of all human life on Earth — and the certainty of its destruction in the long term — we urgently need to be thinking about planting the seeds of Life, and of our race, on other worlds. We have already squandered more than half of the fossil fuels on Earth, mostly on pointless and worthless things (such as making trillions of pieces of Chinese junk that go straight into the landfill forever — after making brief appearances in Walmart and in our living rooms; or making sure that Jamal and LaTwonda have Burger King and air conditioning). The window of time in which we can achieve our destiny in the stars may close forever if we do not act soon. We need a philosophy — a vision — a religion, if you will — that can make that possible.